I’m excited that the tipping point for electric cars may be finally approaching. The Tesla, the Volt, and the Aptera, to name a few, are all getting flurries of blog attention, as is alternative fuel technology in general. San Jose-based Green Vehicles has been popping up in various tech and auto blogs lately, seemingly out of nowhere. Who are these guys, anyway? 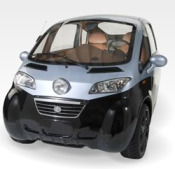 Reviewers are generally of the opinion that the company’s fully electric three-wheeler, called the Triac, is huggably cute. I couldn’t agree more and I totally want one. Actually, I like the Microwat model, too, and may be hard pressed to choose between it and the Triac. One of each? Hmm, with reported prices approaching twenty G’s, I might have to restrain myself to just one. Well, that and my suspicion that my 6′5″ sweetheart wouldn’t be able to fit so much as a shoe inside any of these little cutsie-poos. Oh, well. Be sure to have the sound turned on when visiting GreenVehicles.com so you can enjoy the shiny happy noises that serenade your every click and mouse-over.